Anaphylaxis, a term used inconsistently in the literature, is a severe systemic hypersensitivity reaction characterized by either hypotension or airway compromise that is potentially life threatening in nature and that is caused by chemical and IgE mediators released from mast cells. Anaphylactoid was coined to describe responses clinically identical to anaphylaxis that were found to be non-IgE mediated and that did not require a sensitizing exposure. 1 Recent work has shown that the final pathway in classic anaphylactic and anaphylactoid reactions is identical, and anaphylaxis is now used to refer to both IgE and non-IgE reactions.2 Hypersensitivity is an exaggerated immune system response to presented antigens. Anaphylaxis lies at one end of a gradient of hypersensitivity reactions, and it is important to keep in mind that even apparently mild allergic reactions may progress to severe anaphylaxis. This can be quite dramatic, with erythema and rash all over the body surface, and swelling of the face, lips and tongue. However, if confined to the skin and oral mucosa, it is usually not life-threatening. This reaction responds to oral or parentral antihistamine in addition to corticosteroids. Treatment may need to be continued for a few days until symptoms have completely subsided. Unless the cause of the reaction is known, the patient should be referred to an allergy clinic for evaluation. A number of techniques have been used to identify allergenic proteins, most being based on the principle of Using ELISA or Western blotting, quantitative or semi-quantitative data on the binding of serum IgE to specific proteins can be calculated for individual patients. Generalisations on allergenicity of specific proteins in a food are made by assessing the proportion of affected individuals that have elevated IgE to that protein. These methods cannot predict the degree of symptoms that may be produced on exposure to each individual protein or the outcome of introducing novel foods into a community. Many children in the U.S. and Europe have developed life-threatening allergies to peanuts and other foods. There is a possibility that introducing a gene into a plant may create a new allergen or cause an allergic reaction in susceptible individuals. A proposal to incorporate a gene from Brazil nuts into soybeans was abandoned because of the fear of causing unexpected allergic reactions. Testing of GM foods may be required to avoid the possibility of harm to consumers with food allergies. The ancient Roman poet and philosopher Lucretius was quoted as saying One man's food may be another man's poison. Although Lucretius was not referring to food allergies, his quote applies nicely to these illnesses. Most foodborne illnesses have the potential to affect everyone in the population. However, food allergies affect only a few individuals in the population. Food allergies involve an abnormal immunologic response to a particular food or food component, usually a naturally occurring protein component of the food. The same food or food component would be safe and nutritious for the vast majority of consumers. True food allergies can occur through two different immunologic mechanisms, the antibody-mediated mechanism and the cellular mechanism. The most common type of food allergies involve mediation by immunoglobulin E, or IgE. Food allergy is discussed elsewhere (see 00122 and 00123). It is a frequent diagnosis in childhood. Diarrhea, rashes, and wheezing are common symptoms caused by infection probably more commonly than by food allergy. Parental desire to explain a child's frequent illness may lead to food being wrongly blamed for recurrent symptoms. Vague associations between food and the development of symptoms can result in many foods being unnecessarily excluded and children reduced to diets of very limited variety. For example, whilst 14 of children may be described as allergic to some food, as few as 5 may have had this diagnosis confirmed by their medical practitioners. A tight ring encircling the proximal phalanx may become entrapped because of distal swelling. Such swelling may be the result of trauma, infections, skin disorders, allergic reactions, or the tight ring alone. As the digit expands, venous outflow is restricted by the tight ring, producing more swelling. This vicious cycle may lead to nerve damage, ischemia, and digital gangrene. Vomiting and abdominal pain (not shown in the table) were rarely isolated features of a reaction. Abdominal pain correlated more strongly with severe symptoms than did vomiting. Abdominal pain also correlated more strongly with severe symptoms than did more minor symptoms such as rash or itch. Abdominal pain may be an under-appreciated symptom of at least moderately severe allergic reactions to peanut. Challacombe, eds., Food Allergy and Intolerance, Bailliere Tindall, London, United Kingdom, 1987. P. J. Lemke and S. L. Taylor, Allergic Reactions and Food Intolerance in F. N. Kotsonis, M. Mackey, and J. Hjelle, eds., Nutritional Toxicology, Raven Press, New York, pp. 117-137. D. D. Metcalfe, H. A. Sampson, and R. A. Simon, eds., Food Allergy-Adverse Reactions to Foods and Food Additives, Blackwell Scientific Publications, Boston, Mass., 1991. J. E. Perkin, ed. Food Allergies and Adverse Reactions, Aspen Publishers, Gaithersburg, Md., 1990. W. Strober, Gluten-Sensitive Enteropathy A Nonallergic Immune Hypersensitivity of the Gastrointestinal Tract, J. Allergy Clin. Immunol. 78, 202-211 (1986). R. S. Zeiger and S. Heller, The Development and Prediction of Atopy in High-Risk Children Follow-up at Age Seven Years in a Prospective Randomized Study of Combined Maternal and Infant Food Allergen Avoidance, J. Allergy Clin. Immunol. 95, 1179-1190 (1995). American Academy of Allergy, Asthma and Immunology www.aaaai.org British Allergy Foundation Deepdene House, 30 Bellegrove Road, Welling, Kent DA16 3PY Tel. 020 8303 8525 Fax. 020 8303 8792 www.allergyfoundation.com Food Allergy Network www.foodallergy.org Ortolani C, Bruinzeel-koomen C, Bengtsson C et al. 'Controversial aspects of adverse reactions to food', Allergy, 1999 54 27-45. Sampson H A, 'Food allergy. Part 2 Diagnosis and management', J Allergy Clin Immunol, 1999 103 981-9. And potent response against foreign substances, develop tolerance to ingested food antigens. The means by which tolerance develops is poorly understood, but it is believed that failure to develop tolerance leads to food allergy. The relatively low salivary secretory IgA concentrations, together with the large amount of ingested protein, contributes to the large amount of food antigens confronting the immature GALT. In genetically predisposed infants, these food antigens may stimulate the excessive production of IgE antibodies or other abnormal immune responses. The period of elimination was too short. For example, where a child has an enteropathy (damage to the small intestine) due to food allergy, it may take a week or more for improvement in symptoms to occur. 4. The subject is allergic to other items, which have not been avoided. For example, a child with an allergy to cows' milk protein who fails to improve when given a soy-based milk to which they also have an allergy. The first step is assessment of the patient for sedation in the emergency department. The history should identify any abnormalities of the major organ systems and airway previous adverse experience with sedation, analgesia, or anesthesia any neurologic disorder or impairment medications and allergies and time and nature of the patient's last oral intake. Focused physical examination should include baseline vital signs and oxygen saturation, evaluation of cardiorespiratory status and the oropharynx and airway. Histamine is widely distributed throughout the various tissues of the human body the name derives from the Greek word for tissue, histos. Every mammalian tissue that contains the amine is capable of synthesizing it from histidine by virtue of L-histidine decarboxylase. In most tissues the bulk of the amine is stored in the secretory granules of mast cells. In the blood, histamine is contained in the circulating counterpart of the mast cell, the basophil leukocyte. Histamine and other inflammatory mediators are released by the immunological activation of these cells in the course of immediate hypersensitivity reactions and thereby contribute to the symptoms of allergy and anaphylaxis. Histaminergic neurons of the central nervous system constitute an important non-mast cell source of the amine in humans (see below). Localized allergic reactions to food or aeroallergens are generally confined to particular target organs, such as the airways, eye, gut and skin. However, more generalized, systemic responses may occur, typically in anaphylactic or anaphylactoid reactions to various drugs, agents used in surgical or preoper- The role of histamine in allergy and atopy is well established. As discussed, the amine is released from tissue mast cells and circulating basophil leukocytes by immunoglobulin E (IgE)-dependent mechanisms. This release may be modulated by histamine H> autoreceptors which appear to be present on the sur facc of the human basophil but not the lung mast cell. See also Atopic allergy Basophils Mast cells Hypersensitivity reactions IgE. Review articles on food allergy, prevention and diagnosis, in addition to those mentioned in references, include the following Van Putten, M. C. Frewer, L. J. Gilissen, L. J. W. J. Gremmen, B. Peijnenburg, A. A. C. M. and Wichers, H. J. (2006). Novel foods and food allergies a review. Trends in Food Science and Technology, 17, 289-299. Zuercher, A. W. Fritsch , R. Corth sy, B. and Mercenier, A. (2006). 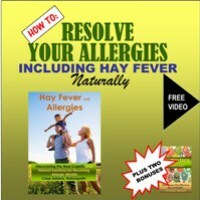 Food products and allergy development, prevention and treatment. Current Opinion in Biotechnology, 17, 198-203. Sicherer, S. H., Sampson, H. A. (2006) Food Allergy. 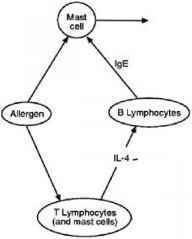 Journal of Allergy and Clinical Immunology, S470-S475. Ortolani, C. Pastorello, E. A. (2006). Food allergies and food intolerances. Best Practice and Research Clinical Gastroenterology, 20, 467-483. For patients with a history of penicillin allergy, clindamycin remains appropriate. Alternatives include macrolides, such as clari-thromycin or azithromycin, which have demonstrated efficacy in experimental models and have convenient dosing regimens, although they are more expensive. Cephalosporins also have demonstrated efficacy, but should not be used in patients with a history of type 1 (immedi-ate-type anaphylaxis) hypersensitivity reaction to P-lactams. For patients unable to take medication orally, intravenous regimens are recommended, and administration of the full dose should be completed within 30 minutes of the procedure. Type I cytokines help to control viral infections by activating NK cells and CTLs. The type II cytokines, especially IL-4 and IL-5, are relevant to immune responses to extracellular parasites and the development of allergies by virtue of their ability to induce IgE production in B cells and enhance the growth of mast cells. The disease leishmaniasis illustrates the importance of activating the appropriate T helper subset. Protection from the disease is dependent upon the activation of the Th, pathway which leads to IFNy production, macrophage activation and parasite killing, and inhibits IL-4 production. In experimental mice, deviation towards a Th2 response can result in death. Multiple factors can influence T cell function and cytokine polarization, including the genetic background of the host, the type of APC, the nature of the costimulatory and accessory molecules, the affinity of the antigen for the MHC and the antigen-MHC complex for the TCR. Since IE is potentially fatal, prophylaxis seems reasonable. The benefit of giving antibiotic prophylaxis to otherwise healthy people, however, should outweigh its risks. The major complications associated with administration of prophylaxis include allergic reactions, toxic side effects of antimicrobials, adverse interactions with other drugs, and development of resistant organisms. A mild form of urticarial rash and itching may be the only manifestation if the sensitivity to food is low or only a small amount has been ingested. Oral symptoms, of swelling and numbness of the lips and localised itching, are common symptoms of allergy to fresh or raw fruits in some patients who are highly sensitive to pollen (oral allergy syndrome). Treatment with oral antihistamine may be sufficient for these episodes. Patients should keep a supply of non-sedating antihistamine such as cetirizine (10 mg) or loratidine (10 mg) tablets. For children, antihistamine syrup (cetirizine or chlorpheniramine) should be prescribed. If the episode does not respond to oral antihistamine or if there are signs of progression, medical help should be sought. Goldberg MJ, Park GD, Berlinger WG Treatment of theophylline intoxication. J Allergy Clin Immunol 78 811, 1986. 13. Melamed J, Beaucher WN Minor symptoms are not predictive of elevated theophylline levels in adults on chronic therapy. Ann Allergy Asthma Immunol 75 516, 1995. Transgenic mice overproducing IL-5 showed highlevel eosinophil production which was proportional to the transgene copy number. These animals have detectable levels of IL-5 in the serum, and show a profound and lifelong eosinophilia, with large numbers of eosinophils in the blood, spleen, bone marrow, lung and gut wall. Interestingly, despite the massive long-lasting eosinophilia, the mice remained apparently normal. This illustrates that increased numbers of eosinophils are not themselves harmful. The tissue damage seen in allergic reactions and other diseases must be due to other factors. Discussions are currently underway regarding the future development of the databank. The difficulties in identifying allergenic ingredients from product labels have not been resolved and there is still likely to be an important future role for the databank, even if the labelling of allergens becomes mandatory in the EC (see Section 6.7.2). The prototype for this subclass of diuretic is acetazolamide, which is a nonbacteriostatic sulfonamide whose adverse reactions include severe allergic reaction and Stevens-Johnson syndrome. The primary action of this class of diuretic is to inhibit carbonic anhydrase in the kidney to prevent the reversible reaction of carbon dioxide and water to form carbonic acid. This results in loss of bicarbonate ions in the urine, along with sodium, potassium, and water. Overdose with this class of medication can lead to volume depletion and electrolyte disturbances, as well as non-anion-gap metabolic acidosis. Treatment is directed at reversing volume depletion, monitoring electrolytes, and restoring normal pH balance. Ate reduction of early IgGl production, it led to weakly enhanced late IgGl and strongly enhanced IgG2a, IgG2b and IgG3 responses. An established IgE response could not be permanently suppressed. Under certain conditions, the induction of an IgE response was even enhanced. This adjuvant effect of IL-12 has been successfully employed to immunize mice with defined bacterial protein antigens. While poor in vivo protection was achieved with Al(OH)3 as adjuvant, IL-12 supported the development of protective immunity comparable to whole bacterial vaccines. The involvement of endogenously produced IL-12 was also demonstrated for the induction of contact sensitivity that represents a classical THl-type response. When administered together with a contact allergen, IL-12 also functioned as an adjuvant. Antibodies may develop after treatment, so retreatment should be avoided. Streptokinase allergy can be seen in approximately 5 percent of patients treated for the first time, especially those with a recent Streptococcus infection. 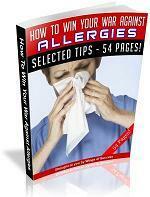 Self-limited allergic reactions usually respond to antihistamines. Fewer than 0.2 percent of patients experience a serious anaphylactic reaction. During intravenous administration, approximately 15 percent of patients will experience hypotension, which usually responds to decreasing the rate of infusion and volume expansion. The 1998 recommended dose of streptokinase is 1.5 million units over 60 min, which produces a fibrinolytic state for up to 24 h. Streptokinase is less costly than other fibrinolytic agents. Although recommended by some authors, no objective evidence supports the use of prophylactic antibiotics. 6 The use of steroids is also controversial. Several studies suggest lack of efficacy or even deleterious effects. Without evidence of efficacy, steroids should be reserved for the treatment of allergic reactions or the treatment of serum sickness. Grain may provide twice as much energy as a coffee can of another. Avoid dusty or moldy feed. Horses are very susceptible to respiratory disease because of allergies to dust from feed. Horses are more susceptible to mold toxins in feed than are ruminants. 10. There is no one best feed or diet. A wide variety of ingredients can be used in horse rations if the diets are properly formulated and processed. Allergic conditions and indeed may be valid for many other diseases which are presently categorized as being autoimmune in nature. Again, understanding of the mechanism of immune memory may lead to novel therapies for both prophylaxis and therapy of these and other related diseases. As a general rule heat decreases the allergenicity of proteins, and heat in the presence of moisture even more so, but this biological activity is rarely removed. Allergenicity of whole wheat flour or purified gluten is only reduced and not eliminated by heating up to 120oC for up to one hour (Varjonen et al. 1996, Sutton et al. 1982). Heating rice glutelin and globulin fractions also reduces IgE binding ability by 40-70 (Shibasaki et al. 1979), but the food remains allergenic. Peanut and nut allergens are resistant to heating and even roasting. Bleeding is the major complication of thrombolytic therapy. Less common complications include fever, embolization of thrombi, and allergic reactions. 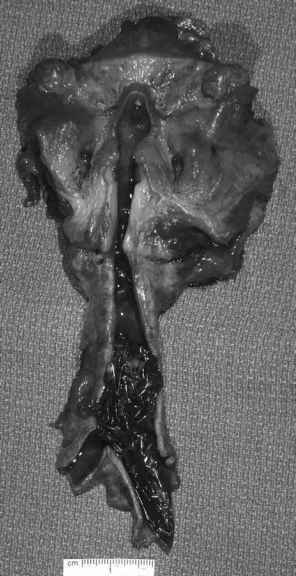 Bleeding complications are primarily due to the dissolution of hemostatic plugs at sites of recent vascular injury. Superficial bleeding is usually not a major problem and can be controlled with local measures. Thrombolytic agents are discontinued at the first indication of major bleeding. Although the half-life of the thrombolytics is short, the systemic fibrinolytic state remains for 12 to 36 h after the infusion is stopped because it takes that long for fibrinogen to replenish itself. Cryoprecipitate can be given to replete fibrinogen and reverse the lytic state. EACA can also be given to inhibit the fibrinolytic state. The main challenge to the food industry is to provide accurate and up-to-date information at all times so that sufferers of allergies can select foods with confidence. Nut oils are an area worthy of comment. Research suggests that refined, bleached, deodorised nut oils do not initiate allergic reactions,2 even in those who are anaphylactic to nuts. Unrefined, cold pressed or virgin nut oils are chosen specifically for their distinctive flavour. These oils are not refined and contain small amounts of protein from the original nut. The same research study showed that unrefined oils were able to cause reactions in individuals who have suffered previous anaphylaxis, but that generally the reactions were not as severe as those experienced when nuts were eaten. The small amount of protein that is present in unrefined oils is removed through the process of refining, bleaching and deodorising, rendering the oils suitable for allergy sufferers. Background to the HACCP studies and the actions that must be taken. Briefing about allergies should be included in all induction sessions and regular updates will ensure that staff continue to be well informed. It is particularly important that information is given to all those who work in an area that handles nuts and peanuts, and all staff understand the importance of the quality controls. All aspects of the supply chain must be evaluated for presence or risk of contamination with key allergens. This includes purchasing of raw or semifinished materials, transport of these materials, storage within the production unit, production, packing and distribution. At each stage full HACCP evaluations of all equipment used, processes and risks need to be undertaken and documented to provide information on the suitability of the product for sufferers of different allergies. A full evaluation of a production line may involve many HACCP studies. Insect bites or stings such as mosquito bites or Hymenoptera stings in general induce immediate and delayed cutaneous reactions. These vary from the common immediate wheal-and-flare reaction and delayed papules to the rare bullous eruptions and Arthus-type reactions. Insect stings of the order Hymenoptera (bees or vespids such as wasps (yellow jackets) and hornets) can also cause allergic reactions. Allergic reactions range from large local reactions through severe systemic reactions to an anaphylactic shock syndrome.